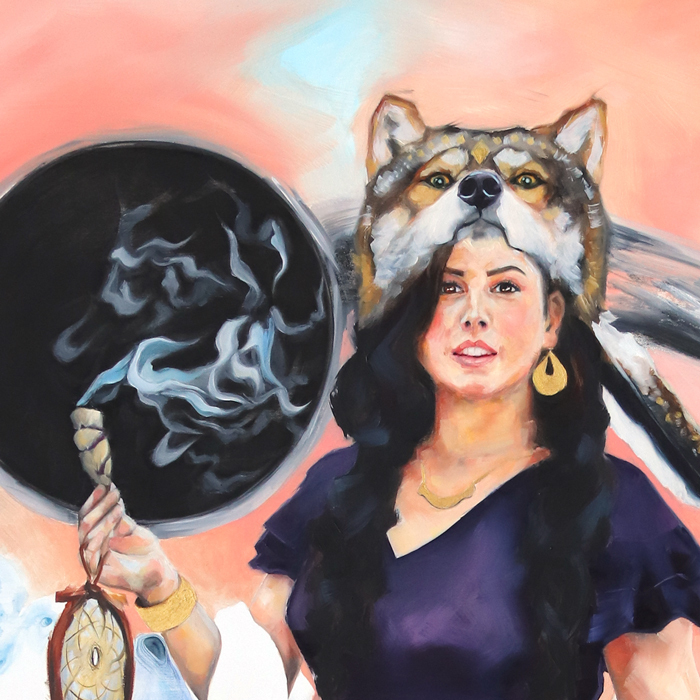 Own the original 24 x 36″ painting of Mother Wolf. A painting so beautiful and mystical you’ll feel like a Goddess every day yourself. Own the original 24 x 36″ painting of the Mother Wolf. She stands before light and dark vortices as she burns sage and her pups play and doze at her feet. Oil, watercolor, 23k gold, and charcoal on panel. The majority of the painting is done in oils with other mediums as accents. The blues within the lighter circle are done in watercolor to accentuate the flow and intangibility of her shawl and arms. Her jewelry is 23k gold leaf. And the black within and without the circles are made from charcoal.